Here at the Greiner Lab, we study ultracold gases that are put into artificial crystals of light called optical lattices. The atoms in the optical lattice end up behaving like electrons in a solid. That means we can use these atoms to simulate models from condensed matter physics in a highly controlled environment. We have developed a microscopy technique that lets us image atoms in optical lattices with submicron optical resolution, so we can see and manipulate individual atoms. This technique gives us unprecedented understanding of the quantum states we create, and lets us perform experiments with remarkable levels of control and accuracy. To learn more about an individual lab, follow the links on the right.follow the links in the navigation bar. Phase transitions are driven by collective fluctuations of a system’s constituents that emerge at a critical point. This mechanism has been extensively explored for classical and quantum systems in equilibrium, whose critical behavior is described by a general theory of phase transitions. Recently, however, fundamentally distinct phase transitions have been discovered for out-of-equilibrium quantum systems, which can exhibit critical behavior that defies this description and is not well understood. A paradigmatic example is the many-body-localization (MBL) transition, which marks the breakdown of quantum thermalization. 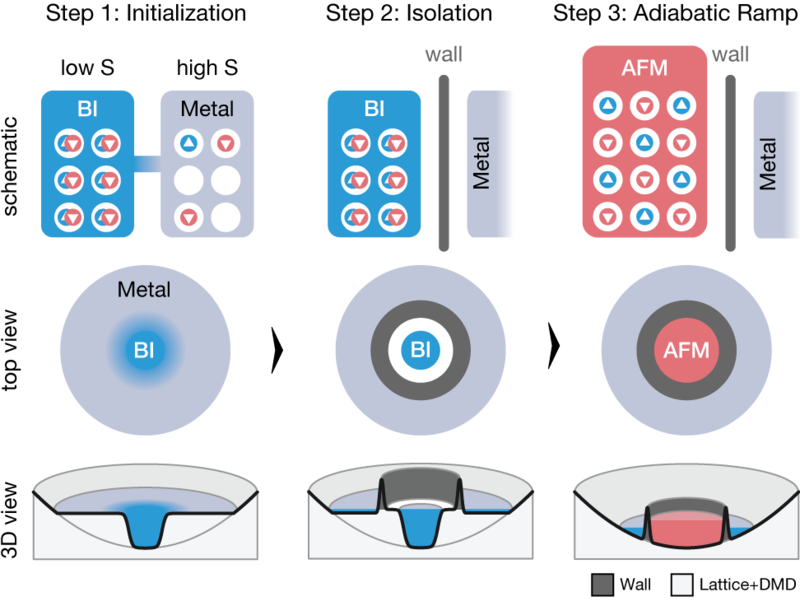 Characterizing quantum critical behavior in an MBL system requires the measurement of its entanglement properties over space and time, which has proven experimentally challenging due to stringent requirements on quantum state preparation and system isolation. Here, we observe quantum critical behavior at the MBL transition in a disordered Bose-Hubbard system and characterize its entanglement properties via its quantum correlations. We observe strong correlations, whose emergence is accompanied by the onset of anomalous diffusive transport throughout the system, and verify their critical nature by measuring their system-size dependence. The correlations extend to high orders in the quantum critical regime and appear to form via a sparse network of many-body resonances that spans the entire system. 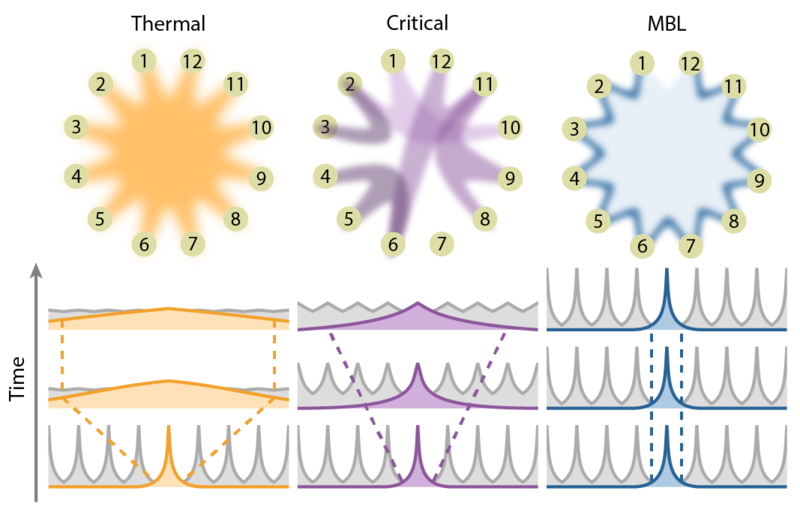 Our results unify the system’s microscopic structure with its macroscopic quantum critical behavior, and they provide an essential step towards understanding criticality and universality in non-equilibrium systems. Understanding strongly correlated quantum many-body states is one of the most thought-provoking challenges in modern research. For example, the Hubbard model, describing strongly correlated electrons in solids, still contains fundamental open questions on its phase diagram. In this work we realize the Hubbard Hamiltonian and search for specific patterns within many individual images of realizations of strongly correlated ultracold fermions in an optical lattice. 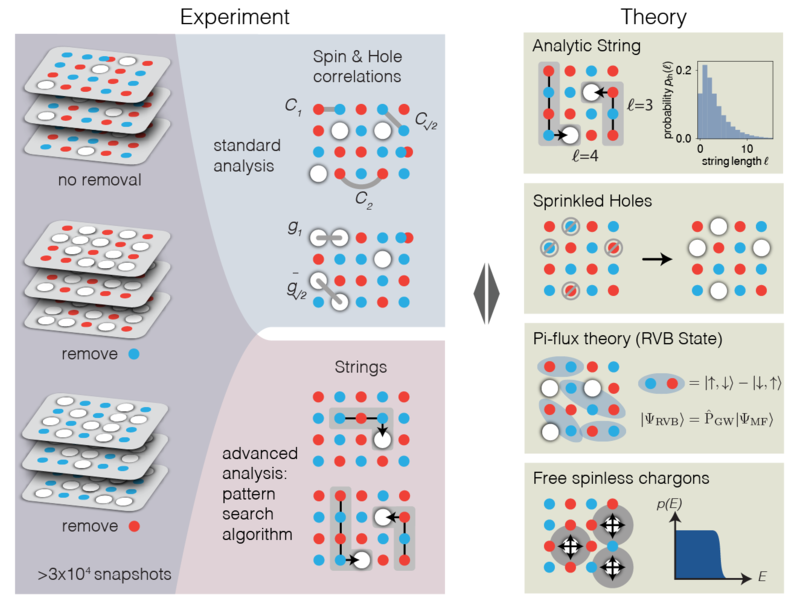 Upon doping a cold-atom antiferromagnet we find signatures of geometric strings, entities suggested to explain the relationship between hole motion and spin order, in both pattern-based and conventional observables. Our results demonstrate the potential for pattern recognition and more advanced computational algorithms including machine learning to provide key insights into cold-atom quantum many-body systems. An interacting quantum system that is subject to disorder may cease to thermalize due to localization of its constituents, thereby marking the breakdown of thermodynamics. The key to our understanding of this phenomenon lies in the system’s entanglement, which is experimentally challenging to measure. We realize such a many-body-localized system in a disordered Bose-Hubbard chain and characterize its entanglement properties through particle fluctuations and correlations. We observe that the particles become localized, suppressing transport and preventing the thermalization of subsystems. Notably, we measure the development of non-local correlations, whose evolution is consistent with a logarithmic growth of entanglement entropy - the hallmark of many-body localization. Our work experimentally establishes many-body localization as a qualitatively distinct phenomenon from localization in non-interacting, disordered systems. Accessing new regimes in quantum simulation requires the development of new techniques for quantum state preparation. We demonstrate the quantum state engineering of a strongly correlated many-body state of the two-component repulsive Fermi-Hubbard model on a square lattice. Our scheme makes use of an ultralow entropy doublon band insulator created through entropy redistribution. After isolating the band insulator, we change the underlying potential to expand it into a half-filled system. The final many-body state realized shows strong antiferromagnetic correlations and a temperature below the exchange energy. We observe an increase in entropy, which we find is likely caused by the many-body physics in the last step of the scheme. This technique is promising for low-temperature studies of cold-atom-based lattice models. PhD student Sukru Furkan Öztürk has joined the Erbium lab. Welcome, Furkan! Master’s student Justus Brüggenjürgen has joined the Lithium lab. Welcome, Justus! Congratulations to graduate student Geoffrey Ji for winning the award for best contributed talk at the Quantum Transport with Cold Atoms conference! Graduate student Joyce Kwan has joined the Rubidium lab. Welcome, Joyce! Sooshin Kim receives NSF fellowship! Congratulations to Sooshin Kim who was awarded a 2018 NSF Graduate Research Fellowship! Thanks to Ying Gao, Anzet du Plessis, Frankie Schembri, and Professor Thomas Levenson for this short documentary on our lab and the field of Ultracold Atoms! Greiner Lab members take home multiple awards at the 2016 ICAP Poster Session! 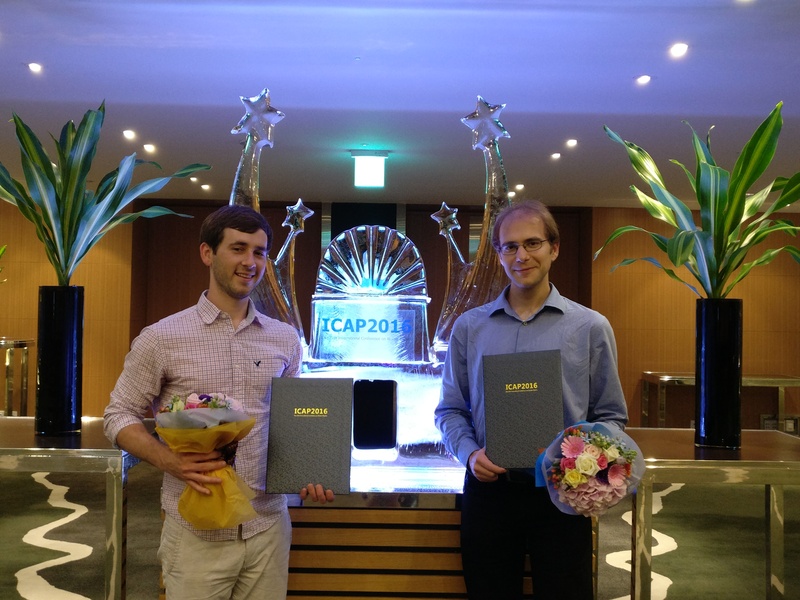 Anton and Matthew win awards for their posters on Probing Antiferromagnetic Ordering and Dynamics with the Fermi Gas Microscope and Quantum Thermalization in an isolated many-body system, respectively.